The coolest EVs won't win people over if there's no place to charge them. We may soon be in the era of the electric car. Today, they’re around of course, but they’re not yet ubiquitous. That may soon change, Bloomberg New Energy Finance predicts — by 2025, some EV models could cost less than their gas-guzzling competitors. The biggest reason? Lithium-ion batteries, a key component of tomorrow’s electric cars, are getting cheaper. Analysts suspect that is enough to make the price of electric cars go way, way down. But let’s not get ahead of ourselves — the global electric car revolution is coming, but its timeline may not be speeding up so much. And there are a bunch of practical reasons why. China’s pushing EV adoption, too, going as far as suggesting a ban on oil-guzzling cars “in the near future,” according to CityLab. France and the United Kingdom also announced they will ban gasoline cars by 2040, a sign of their commitment to alternative forms of transportation. But ultimately, if electric cars are to really take off, countries will need a charging network big and efficient enough to actually work. When cars first became popular, gas stations started popped up, first in cities, then in smaller towns, eventually reaching even the most remote rural settlements. This spread was haphazard and over a long period of time, but today’s drivers know that wherever they go, they are almost certainly not going to run out of fuel. The same can’t be said for electric cars. At least, not yet. Numbers-wise, China is way ahead, with around 150,000 public charging points already; the U.S. has around 16,000. 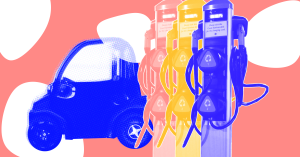 While China’s numbers may seem impressive, “I don’t think there are more than a couple dozen publicly available charging stations in any city,” Sabrina Howell, a New York University finance expert, told CityLab. Beijing plans to boost its network of charging stations to meet the demands of 5 million electric cars by 2020, but experts say that simply upping the numbers is not enough. For example, charging several EVs at the same time may cause brownouts if there’s not enough voltage in supply. Souping up the existing electric networks to make room for charging points would likely cost a fortune, studies found. When you think about it, putting charging points where drivers will need them most really doesn’t seem all that hard. After all, we equipped the world with gas stations without a business plan or a strategy at all. But — but — it took a very long time to get there. As climate change threatens the way of life of billions of people around the globe, we don’t have that same luxury. Even the coolest, cheapest electric model won’t win people over if they don’t know where to charge it.